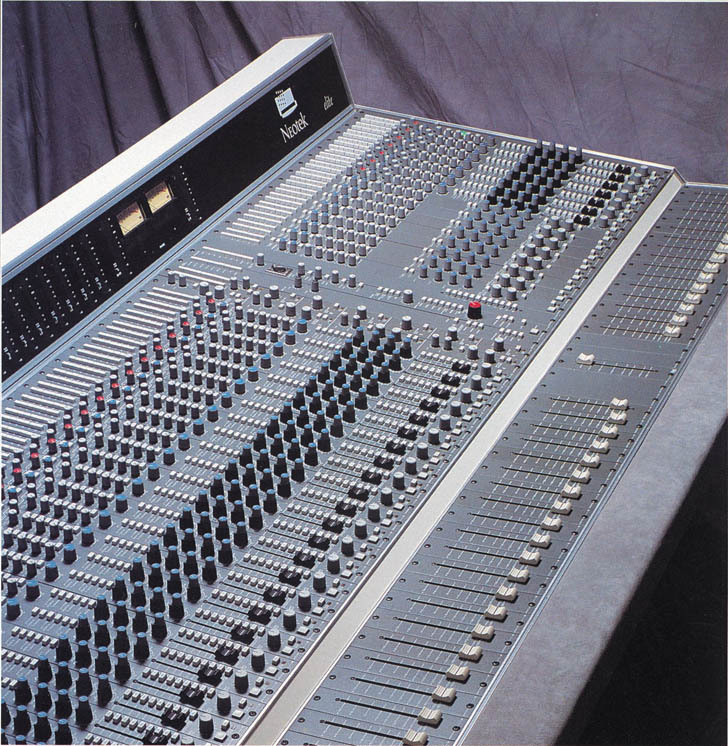 The Neotek Élite console series is designed for the variety of challenges you face in today’s professional audio environments. Whether you are involved in music recording, broadcasting, post production, or combinations of these, the Élite meets your needs for flexibility, performance, and unbeatable audio quality. Neotek Élite consoles provide contemporary multipurpose studios with outstanding flexibility, superlative sonic performance, and ordering options which allow each console to be configured for maximum productivity in its specific working environment. The Élite offers audiophile performance microphone preamplifiers and completely transformerless, high speed circuit design for exceptional integrity when tracking. In mixing mode, engineering creativity and ease of use is maximized by full command of a large number of input channels, the availability of powerful equalizers, comprehensive routing, and audio system integrity that maintains the subtle qualities of each signal within a complex mix. In addition, the Élite can be ordered with custom options that adapt it to leading edge broadcast production and post production applications. When work leaves your facility, the way it sounds is what really counts. That’s why the Élite’s design is focused on outstanding audio performance. The Élite offers audiophile quality microphone preamplifiers and high speed circuit design to give you exceptional signal integrity. Critical stages in the minimum path signal chain are specially designed hybrid circuits which transcend the performance of integrated operational amplifiers. Unparalleled circuit design is one reason why the Élite is one of the very few consoles worldwide that has been accepted according to the demanding standards IRT Pflichtenheft 3/5 and Nordic N-10. The Élite’s wide bandwidth and brilliant transparency give you absolute confidence that the material you release is exactly what you intend. We’ve focused the Élite on features that offer engineers and facility owners real benefits. The Élite gives you the power of in-line monitoring plus extra signal routing possibilities from its dual-channel architecture. In mixing, its monitor fader becomes an additional input. This doubles the size of your console to provide the capacity needed in modern studios, and you can create up to 32 auxiliary sends as well as mono or stereo subgroups with their own aux mixes. The Élite gives you three mute groups and four solo modes; highly regarded four-band multi-mode EQ with state variable topology, plus sweep high pass filter; stereo modules; and a broad selection of fader module options. And its high-resolution bargraph meters have true VU and peak ballistics to give you an accurate measure of signal levels—with N-9 and DIN meters as options. The Élite’s flexibility and ease of use mean you’ll spend more time creating, less time correcting. The classic build quality of the Élite sets it apart. Its solid construction is designed to stand up to the rigors of remote trucks. Patchbays use shielded cable and long-frame metal jacks. And when you lift the hood and check the modules you’ll see advanced circuit designs and the best quality components throughout. The Élite is built for the long run, and it holds its value and high performance year after year. Your clients will understand that your console, your facility, and your work are fully professional. There are a number of ordering options for your Élite, including your choice of factory installed moving fader automation systems. You can select internal or external desks; internal, side car, or remote patchbays; and special versions for film-style post production and multi-studio broadcast production. Contact Sytek and we’ll send you additional brochures on ordering options, frame sizes, technical specifications, and a more detailed system description. With its outstanding build quality, professional features, and exceptional sonic integrity, the Élite in your facility will produce work with the quality and impact you would expect from the highest performance consoles being made today. Who's using the Élite II? NBC Tonight Show, Los Angeles, CA. Boogie Park Studios, Hamburg, Germany. Trax East Studios, South River, NJ. LiveWire Remote Recorders, Toronto, Canada. Conservatory of Recording Arts & Sciences, Tempe, AZ. Warner Brothers Post Production, Burbank, CA.